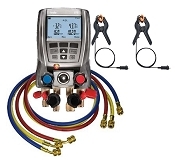 The testo 557 4-valve with 3/8 vacuum port digital manifold comes with a remote vacuum probe for faster and more reliable evacuations, Bluetooth App, two clamp temperature probes for instantaneous superheat / sub-cooling readings, and convenient service case. 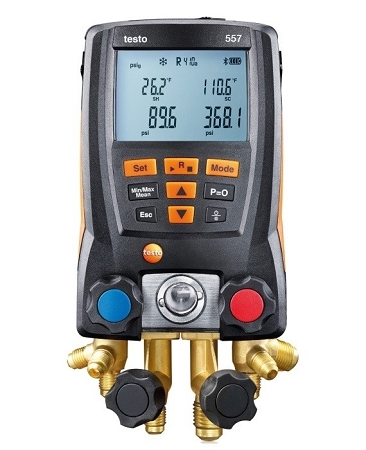 The testo 557 digital manifold has a 4-way valve block, large backlit display and sight glass. 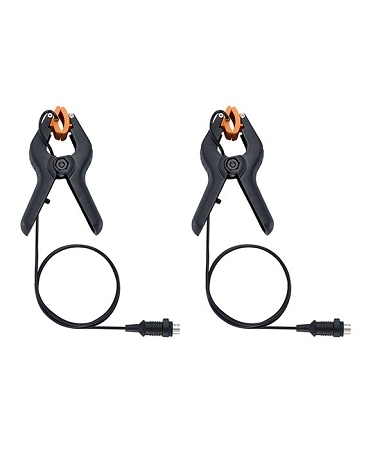 Two NTC thermistor clamp probes provide superior accuracy of simultaneous, real-time superheat and sub-cooling readings. An external vacuum probe provides fast and more reliable evacuation of the system. The wireless Bluetooth / App allows you to view measurement data on your Smartphone or Tablet, enabling you to quickly and conveniently complete and document your job. Then, be able to finalize the documentation and send the reports and invoice via email, right from the job site. In addition to the 60 refrigerant profiles stored in the instrument, the App can also be used to download new refrigerants from the Internet directly into the digital manifold. Q: How do you use the top vacuum port if the vacuum gauge is built into the display? 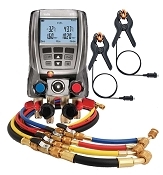 I looked at the downloadable manual from Testo for this unit, and it doesn't even say anything about a top port at all. A: The top port is an electrical connection to a separate vacuum probe. The fitting to connect the vacuum probe to the system is on the vacuum probe itself. 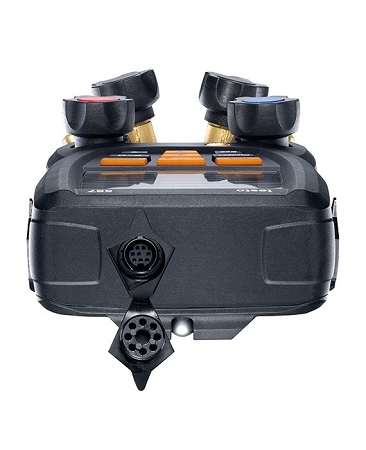 Testo has (wisely) decided not do put a vacuum sensor inside the manifold, but instead in a separate probe, so that you are truly testing the system for vacuum and not including the manifold in your vacuum test. Was this answer helpful? 17 of 23 Customer(s) found this Answer helpful. Q: Is this refurbished price at $399 or is it new from manufacturer for $399? Does it come with 5 year warranty ? A: This is new equipment. If TruTech ever sells used equipment, which is rarely, the product description will have the word USED in it. 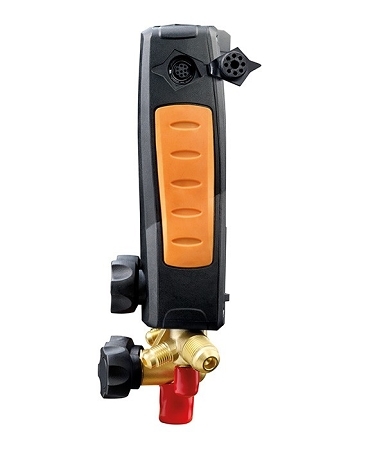 Testo, the manufacturer, offers a 2 year warranty on this unit. However, if you register your unit with testo after purchase, you will get a total of 5 years warranty. 492 TruReward$ points will be placed in your account when you buy this item.